Pitch sequencing, in my opinion, is the next big thing in the field of baseball research, and despite what Samsung might like to tell you, it isn’t here yet. There has been some tremendous work done, but we’re still a long ways away from aggregating findings into one clearly defined picture of how pitch sequencing exactly works. But we might as well continue to add to the findings. 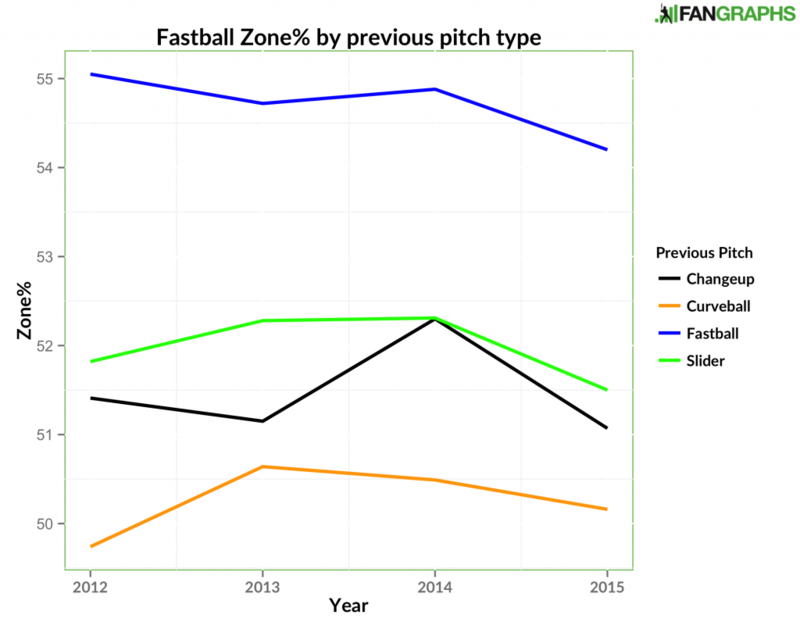 I looked at one aspect of pitch sequencing – shifts in the called strike zone – last month. Next, I’m looking at how best to set up different types of pitches. We’ll start with four-seam fastballs, and, so as to keep it simple for now, focus just on the fastball and on the pitch immediately beforehand. Not pitches before that in the same at-bat, not pitches to the same batter earlier in the game, not pitches to that batter from a different game. Intuitively, you might expect changing speeds on the batter to be an effective way to mess with their swing and timing. A changeup, then, should be a good pitch to set up a fastball – changeups are generally 10-plus mph slower than the same pitcher’s fastball. 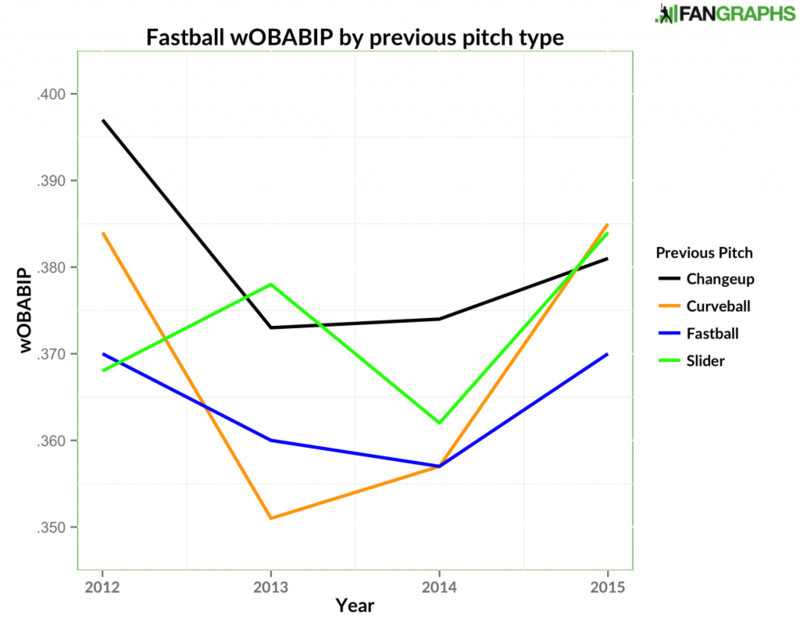 Curveballs, too, should be decent setup pitches, as should sliders to a lesser extent. (Sliders are usually thrown harder than curves.) As it turns out, though, it doesn’t quite work that way. There’s some year-to-year variation, but, by and large, changeups are ineffective ways to get swings and misses on the fastballs which follow them. Now, bear in mind, the scale here isn’t so large – it’s a few percentage points each way. But it’s still pretty clear that changeups, as well as curveballs, don’t help the pitcher throw a better fastball the next pitch. This seems very counterintuitive, so there are surely some biases we’re missing, right? Maybe the pitchers who throw two fastballs in a row have better fastballs and are weighing down the contact rate by adding lots of fastball-fastball swing and misses. Maybe two fastballs in a row means that the second one is more often in a location where it is difficult to make contact, such as outside the strike zone. (League-average contact rate is 85% within the strike zone and 61% outside of it.) Maybe the second consecutive fastball is more likely to be thrown in a two-strike count, where batters have to protect the plate, and a fastball preceded by a changeup is more likely to be thrown in a three-ball count, where batters can swing at what they want. The more times a pitcher threw two consecutive fastballs (where, again, the first was any kind of fastball, not just a four-seamer), the better that second fastball did contact-wise. Note, however, that (a) the effect is small and (b) the average pitcher, not weighting by number of pitches thrown, has a higher contact rate on fastballs that follow changeups anyways. Without weighting, we can be sure that no one small subset of pitchers (i.e. those who throw a lot of fastballs and get a lot of swings and misses) is heavily affecting the scale. The other explanations actually work against our intuition and support the first graph. For one, fastballs that follow fastballs are actually thrown in the strike zone much more often than fastballs that follow changeups. 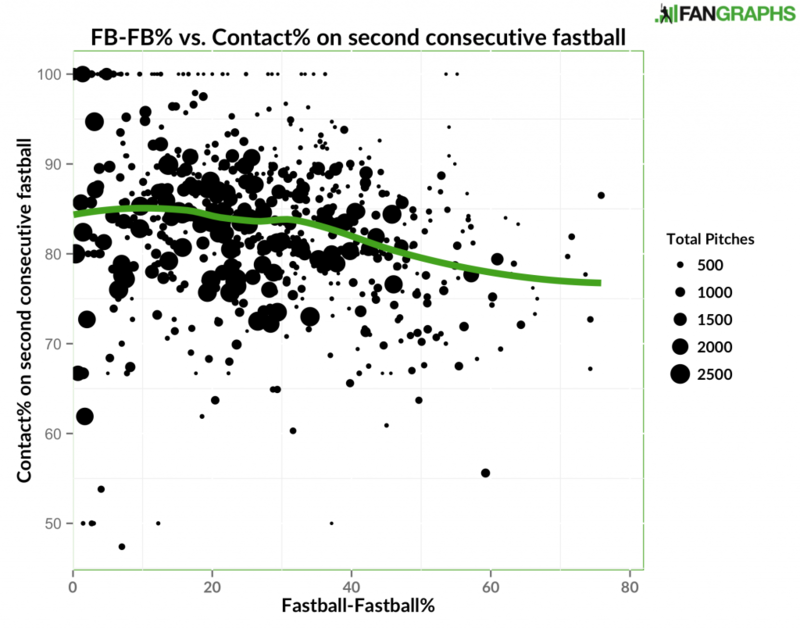 Again, contact rate in the zone is 24 percentage points higher than out of the zone, so seeing fastballs at the top of this graph indicates that maybe the contact rate on fastball-fastball sequences should be even lower. In 2015, fastball-fastball contact rate was at least three percentage points lower than changeup-fastball contact rate for both pitches inside and pitches outside the strike zone. Fastball-fastball sequences are thrown in three-ball counts more often than changeup-fastball sequences are. Changeup-fastball sequences are thrown in two-strike counts more often than fastball-fastball sequences are. As the following table suggests, that should favor the changeup-fastball sequences in terms of producing swings and misses. Two-strike counts lead uniformly to lower contact rates than three-ball counts. 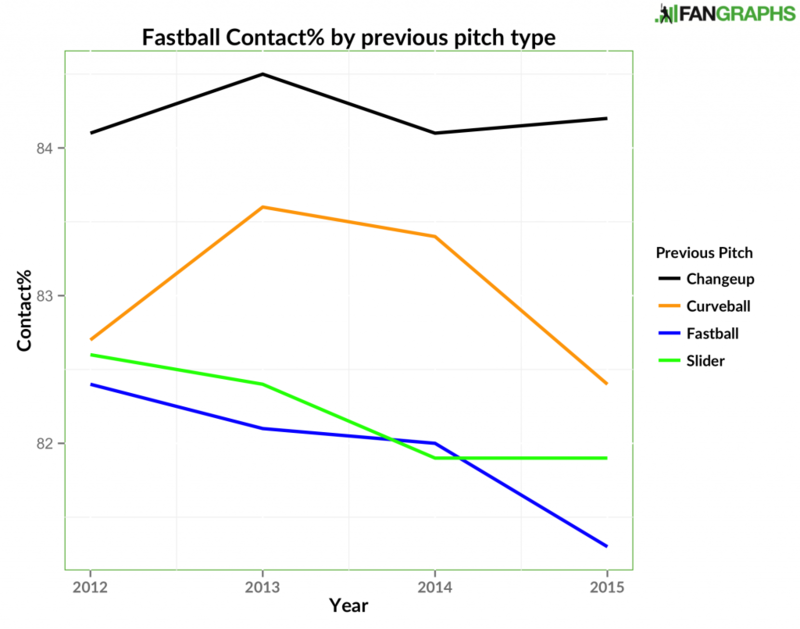 And yet, despite that, fastball-fastball sequences manage to produce a lower contact rate, year in and year out. Furthermore, fastball-fastball sequences have a lower contact rate than changeup-fastball sequences both with three balls and with two strikes. Of course, contact rate isn’t everything. It’s an important thing for sure, but what if the contact that is made on those changeup-fastball sequences is better contact than on the fastball-fastball sequences? 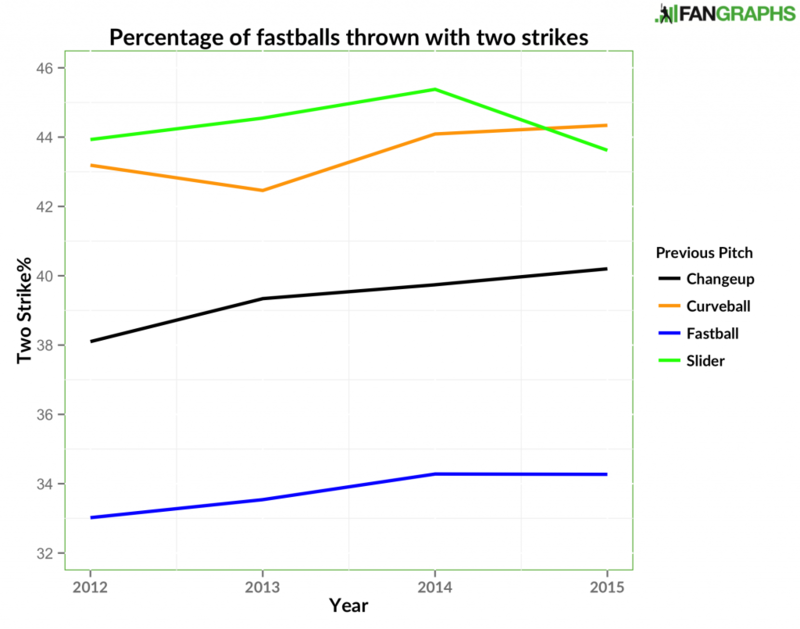 The lesson: fastballs set up fastballs well, changeups do not. That’s not to say, of course, that changeups are useless pitches. They are better at generating swings and misses than fastballs are, and, when disguised well, they can be effective at tricking the hitter and getting him to swing early. But they aren’t any good at priming the batter to swing and miss at a fastball the next pitch. We hoped you liked reading How (Not) to Set Up a Fastball by Jonah Pemstein! 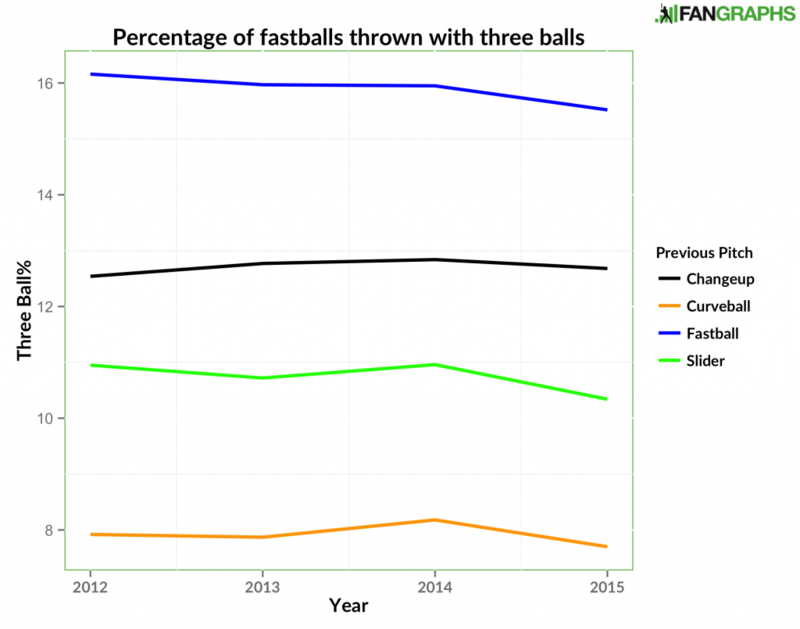 How common are consecutive fastballs? Maybe batters are not looking for this and mentally preparing for an off speed pitch for the second pitch? More common than changeup-fastball sequences. Very interesting thoughts. If variance decomposition showed a shift between pitcher and hitter of chance contact/control of contact, would that amend your analysis?